Located on the Caribbean coastline and directly to the north-west of San Gervasio, Cozumel International Airport (CZM) is a small facility, providing flights to and from mainland Mexico, together with international destinations, of which a large proportion are US cities. Cozumel's airport is located just 3 km / 2 miles to the north of central Cozumel and close to innumerable sandy beach resorts, many world-class dive sites and a number of ancient Mayan ruins. The complex is particularly near to Santa Pilar and operates a single terminal with around 40 check-in desks, which have a reputation for speed and efficiency. While somewhat limited, facilities at Cozumel Airport cover all of the main essentials for its 450,000 annual passengers, with March, June and July being especially busy months. Airport minibuses provide transport to popular Cozumel resorts for those whose hotels do not provide free shuttle services. Alternatively, a taxi rank is located just a short distance away and slightly outside of the actual airport grounds. Situated just 19 km / 12 miles off the coast of the Yucatan Peninsula, Cozumel is Mexico's largest island, which is famous for its fantastic sandy beaches and crystal clear sea waters. Besides opting for a lazy sunbathing holiday, visitors can take trips to the mainland, where a day of shopping, dining and sightseeing awaits. Alternatively, Cozumel Airport (CZM) is within reach of several interesting attractions close to the island, such as the resort of Playa del Carmen, the city of Cancun, the ancient site of Chichèn Itzá, with its rich Mayan history, and Xel-Ha, the beautiful National Underwater Park. 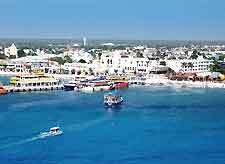 San Miguel de Cozumel is the island's most significant town and sited on the island's north-western coast, being where the majority of its population reside. Here visitors will find traditional Mexican life, as well as a plethora of tourist amenities, hotels and eateries, based around the Plaza Central (El Zócalo).